Drumroll please… the results of our Green Halloween Costume Contest are in and this year’s competition was a nailbiter! From the bizarrely coincidental Under The Sea theme that seemed to spontaneously emerge this year with all of the pirates and mermaids, to the political, mythical, and in between, this year’s costumes showed us that there are no limits to imagination and resourcefulness when it comes to DIY costume making. Mateys, we had a blast looking through all of the clever and innovative entries and hope you did too. Behold, the winning costumes after the jump! 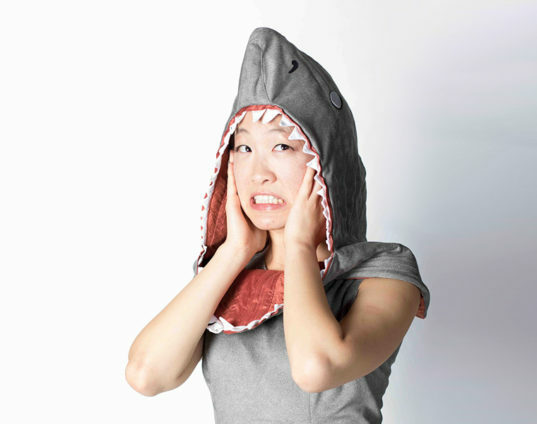 This fierce homemade shark getup by Jean Saung is one half of a sharknado costume (her friend was a tornado), and naturally this brilliant idea blew our judges away. Saung’s funny, beautifully handcrafted costume is made from leftover microsuede and features a detachable hood. It was an easy hit with our judges, who selected it as the Grand Prize Winner of this year’s contest. Jean wins a Little Goodall handmade coat, which we hope she will enjoy. 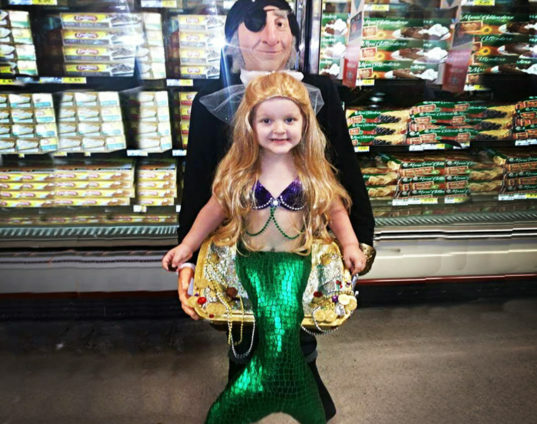 Our second place winner, selected by our panel of esteemed judges, is Kayla Davis’s clever optical illusion costume: a kidnapped mermaid in a pirate’s chest, made from papier-mâché and everyday items around the house. Kayla will also receive a critter coat from Little Goodall. Ahoy mateys! We couldn’t believe we had TWO captured mermaids in pirate-chests facing off in this competition! The Inhabitat readers voted Audrey Alfaro’s enchanting mermaid (along with her handcrafted optical illusion pirate captor) to the top. The Reader’s Choice winner gets to take home one child’s critter coat courtesy of Little Goodall. 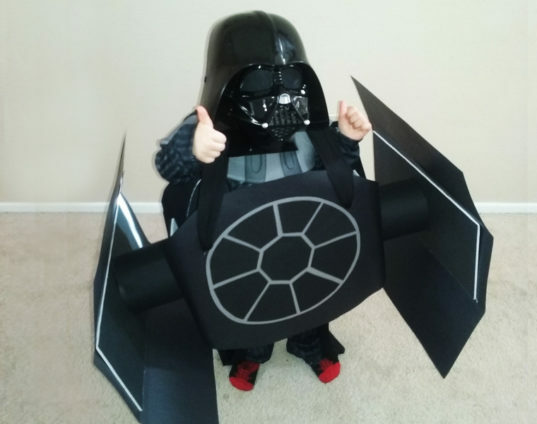 This clever costume features Darth Vader and a poster-board tie-fighter, proving that the force is always with DIY costumes. Yeehaw! Hats off to this pint sized cowboy. 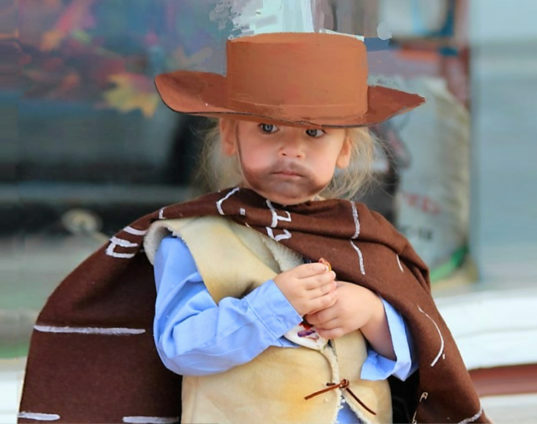 This adorable Baby Clint Eastwood costume is all good and not at all bad or ugly. 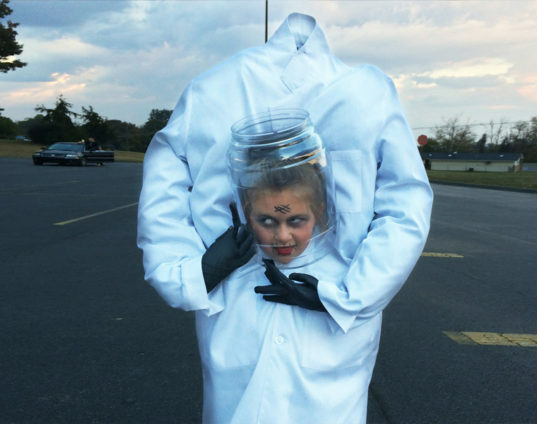 Equal parts creepy and clever, with the help of an optical illusion torso created by PVC pipe and a large shirt, “I Lost My Head” embodies the best of the Halloween’s spooky spirit. This intricate costume boasts all the components we love about the eco-friendly abodes, including the likes of solar panels, wind turbines, rainwater collection systems, triple-pane windows, and even a Tesla power wall and charging system. We’re impressed! 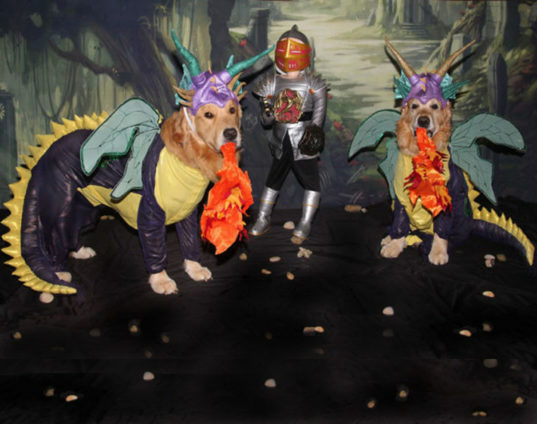 The doggie duo is back, turning fire-breathing dragon into the most adorable four-legged costume of the season. A heartfelt THANK YOU to everyone who took the time to enter our contest and vote! Special thanks to Little Goodall for donating these beautiful coats to our grand prize winners. Family owned Little Goodall handcrafts outerware that can double as cozy and adorable Halloween costumes, so naturally their critter coats came to mind as the perfect prizes for our Green Halloween Costume Contest. Made from 100% wool felt, these adorable and eye-catching masterpieces are made to last a lifetime, turning every moment outdoors into a colorful adventure. 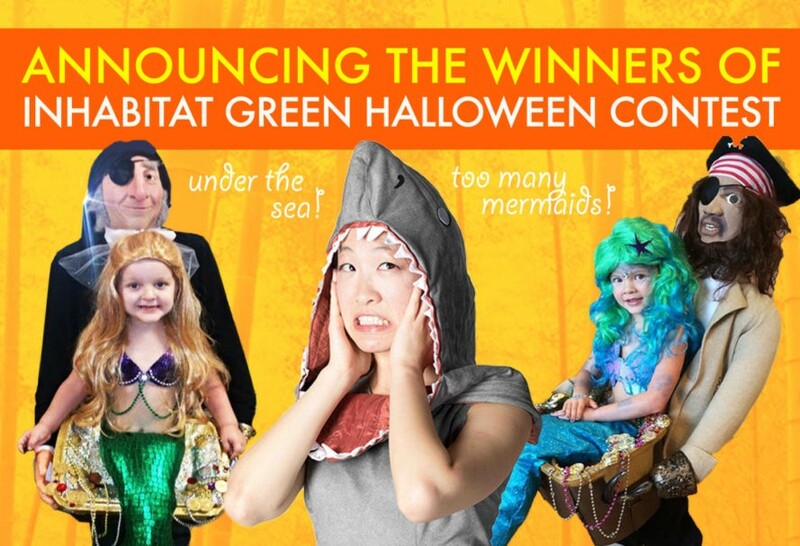 Announcing the WINNERS of Inhabitots� 2016 Green Halloween Costume Contest! 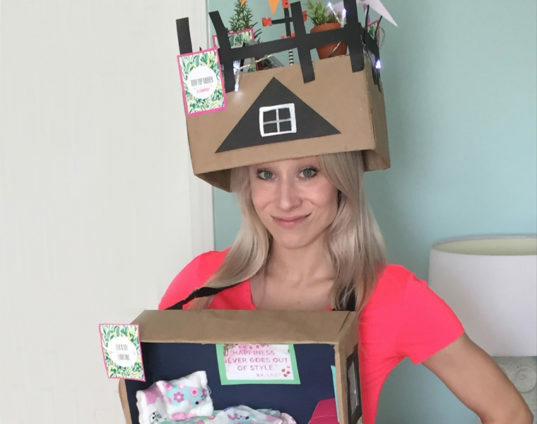 Drumroll please� the results of our Green Halloween Costume Contest are in and this year�s competition was a nailbiter! From the bizarrely coincidental Under The Sea theme that seemed to spontaneously emerge this year with all of the pirates and mermaids, to the political, mythical, and in between, this year�s costumes showed us that there are no limits to imagination and resourcefulness when it comes to DIY costume making. Mateys, we had a blast looking through all of the clever and innovative entries and hope you did too. Behold, the winning costumes after the jump! GRAND PRIZE WINNER: Sharknado This fierce homemade shark getup by Jean Saung is one half of a sharknado costume (her friend was a volcano), and naturally this brilliant idea blew our judges away. Inhabitat readers may (or may not) remember the Sharknado story (about sharks living in a volcano) that went viral in 2015. Of course our judges remembered it, and we loved to see this story come back to life in such a beautifully handcrafted costume. Made from leftover microsuede and featuring a detachable hood, this costume is both funny and well-crafted, making it an easy hit with our judges, who selected it as the Grand Prize Winner of this year's contest. Jean wins a Little Goodall handmade coat, which we hope she will enjoy. SECOND PLACE WINNER: Kidnapped Mermaid Our second place winner, selected by our panel of esteemed judges, is Kayla Davis's clever optical illusion costume: a kidnapped mermaid in a pirate's chest, made from papier-mâché and everyday items around the house. Kayla will also receive a critter coat from Little Goodall. 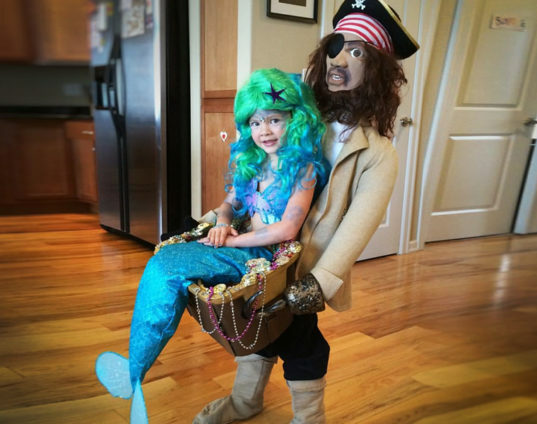 READER’S CHOICE WINNER: Mermaid in Captain Blackbeard's Treasure Chest Ahoy mateys! We couldn't believe we had TWO captured mermaids in pirate-chests facing off in this competition! The Inhabitat readers voted Audrey Alfaro's enchanting mermaid (along with her handcrafted optical illusion pirate captor) to the top. The Reader’s Choice winner gets to take home one child’s critter coat courtesy of Little Goodall. “I Lost my Head” Equal parts creepy and clever, with the help of an optical illusion torso created by PVC pipe and a large shirt, “I Lost My Head” embodies the best of the Halloween’s spooky spirit. Net Zero Green Home This intricate costume boasts all the components we love about the eco-friendly abodes, including the likes of solar panels, wind turbines, rainwater collection systems, triple-pane windows, and even a Tesla power wall and charging system. We’re impressed!